How ready are you to handle headlines and fallout about your law firm or your firm’s clients, such as: “Partner Embezzles Millions from Firm” or “(Firm Client) Covers up Neighborhood Toxic Spill for Decades” or “Law Firm Closes Doors After Lawyers Jump Ship”? Public relations crises—both large and small, public or private—happen daily, and your readiness to manage those situations will help determine how well your firm or organization is perceived afterward. The “Elements of Crisis Management” webinar offered by the Legal Marketing Association’s Public Relations SIG provided advice for all levels of experience. Former journalists Joshua Peck, PR director at Duane Morris LLP, and Scott Sobel, president of Media & Communications Strategies Inc., were the presenters, each of whom has handled high-profile crises from all perspectives, first writing about and now defending against. “The personality of the spokesperson can be the tipping point when the spotlight is on. People judge how you handle the crisis, more than the crisis itself,” said Sobel. For a crisis happening with a law firm’s client, the crisis team has to have the freedom to handle what needs to be done, but must recognize that the attorney in charge of the client and the crisis at hand oversees the legal dimension. In general, legal needs take priority over PR needs, and business continuation must remain a priority. While communications perspectives and guidance must be offered by the PR professional, the partner’s decisions are final, Peck reminded participants. Peck advised that the first thing to do when the crisis becomes known is to learn what happened. While this may seem obvious, it’s not always done. “Gather all the facts available. Understand what happened – who, why. The impression the public has may not square with reality, so dealing with both the reality and the appearance or perception of what happened are equally important parts of the crisis team’s responsibility,” Peck said. Have a general holding statement ready to share that addresses what you know now, and when updates or a final resolution can be shared. It doesn’t have to commit to initial facts, but it should say the facts may change as new information is uncovered. Follow up as promised. The initial crisis communications should also include a sincere apology, if warranted, and show compassion. It should feature short, simple, declarative action statements. When the timing is appropriate, explain what will be done to prevent the issue from happening again, and, as soon as you can—with permission—begin to talk about your solution. The media want succinct, non-jargon info, and they want it quickly, said Peck and Sobel. Thinking ahead is another important element to include in the crisis management plan. “A reasonable goal is for the team to consider the question, ‘If it goes as well as possible, in 30 days, we will have…’ You should be able to identify what that needs to be, such as, we addressed the crisis, we let outside enforcement/independent assessment come in or whatever else you might want to have happen in the future. Then, get your ducks in a row to get the best possible outcome in those next 30 days,” recommended Peck. Sobel advises being flexible when executing a crisis plan; have as much structure in place as possible, but be ready to change direction quickly. 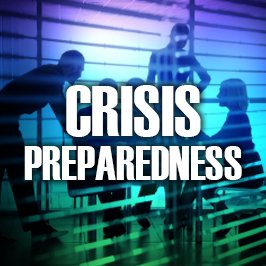 For help with preparing a crisis PR plan, please contact Vivian Hood, President, Public Relations, at vhood@jaffepr.com or 904.220.1915.